A starter I love. Even good for a full meal. Or start off with the tartare and finish off with a light fish soup. The fresh salmon can be replaced by any other white fish. For those that don’t eat raw salmon, smoked salmon can be an option. *Order some fresh salmon from you fishmonger, telling him it is for tartare…having pride in his knowledge and job, he’ll see to you getting the best quality fish; cleaned, bones and skin removed. Wrap in clingfilm and leave in the freezer to get to a softly frozen stage. Remove, cut into small dice and transfer to a mixing bowl. Add a drop or two lemon juice(not too much or else the fish will”cook” and lose its bright colour), olive oil and freshly milled pepper to the salmon, mix ightly with a fork, cover and leave to marinate in the fridge for at least 30 minutes. *In the meantime, chop some red onion finely and a handful of fresh dill. Cut a lemon into small wedges. Toast some dark ry bread, and cut into small triangles. 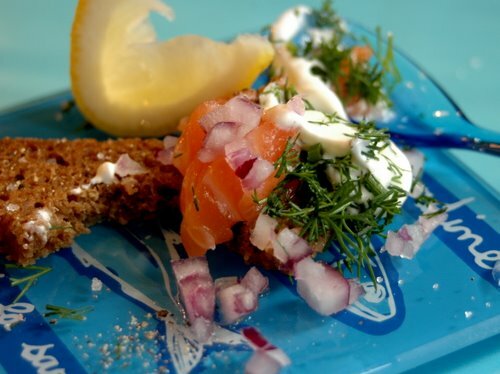 *Serving: Serve the salmon along with the chopped onion, dill, lemon wedges, a dollop of créme frâiche and the rye toasts in small bowls on individual plates. Serve extra fleur de sel or maldon salt and freshly crushed black pepper on the side. Previous Article Avocado salad and tomato sauce. My son-in-law, who’s a pushy fellow but a lovely man, tormented me until I tried sashimi. I was certain I wouldn’t like it until he pointed out the textural parallels, comparing tuna’s chew to steak and salmon to — of all things — chocolate. Indeed, salmon tends to melt in your mouth, and this preparation would seem to enhance that. What a lovely recipe. Thanks. My MIL loves salmon tartare, till now i have never had the nerve to taste them as it is raw. But have to admit i am a coward when it come to taste raw fish. If it weren’t for the mercury in salmon…I’d have it daily…especially tartares. this is beautifully presented and looks like such a treat! 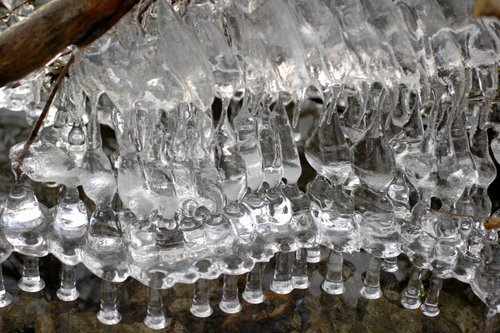 and what wonderful pictures of ice sculptures… so much better than man-made! i love raw fish, not even pregnancy could stop me from having my weekly sushi fix and i will definitely make some fish tartare soon – it’s so good for you and deliciously moreish at the same time! That sounds so good. Fresh, light, excellent! 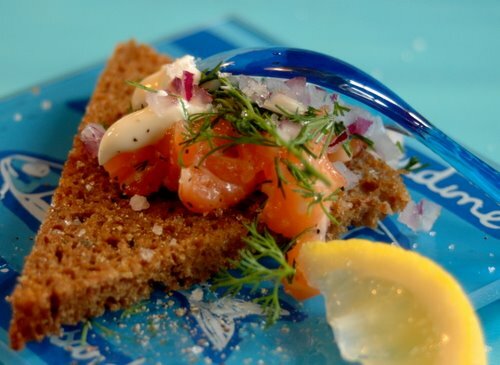 I have made salmon tartare many times but your presentation is so brilliant I will copy it! Our favorite restaraunt in Chelsea Quebec, (Loree du Bois) serves a salmon tartar appetizer, delicious! Yet I never considered making one myself, until I saw your presentation. It looks so appetizing, lovely! Thanks for the inspiration. Very beautiful! You have such lovely light. This is my kind of appetizer. And I DO eat things like this for a meal. It is perfect. The funny thing is I prefer salmon raw, or smoked as opposed to the cooked. Now put this salmon in the avocado in your below post and you REALLY have pure bliss. Such a pretty way to plate it. I’m with you, this is always one of my favorites. Havent been here for ages. Havent actually blogged for almost three months. 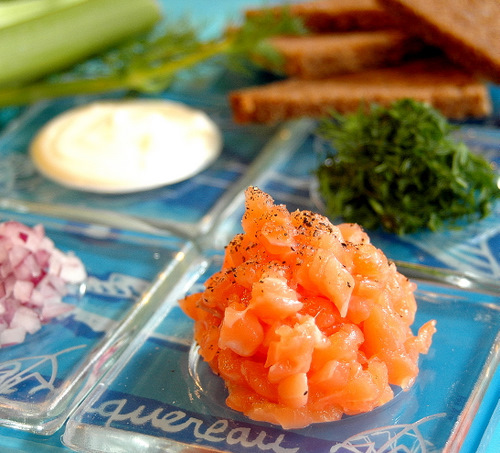 Love tartar myself, beef, salmon, any. I was just wondering whether you had any chance to cook fromt he Arusuvai ingredient I sent you. this looks beautiful and is such a simple idea for a salmon appetizer or meal. i will definitely try it this weekend for brunch! 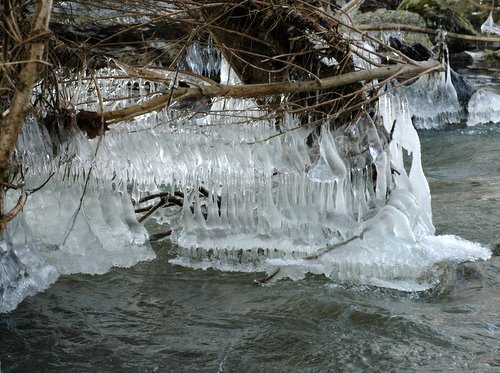 Your pictures are absolutely gorgeous! Love your site! Hi Ronell- just stopped by to say hi. Hope all is well, Ronell. I never tire of looking at your art, but it’s been a while. Skillful Web Site, but it doesn’t really showed exact in WorldWideWeb (Nexus).